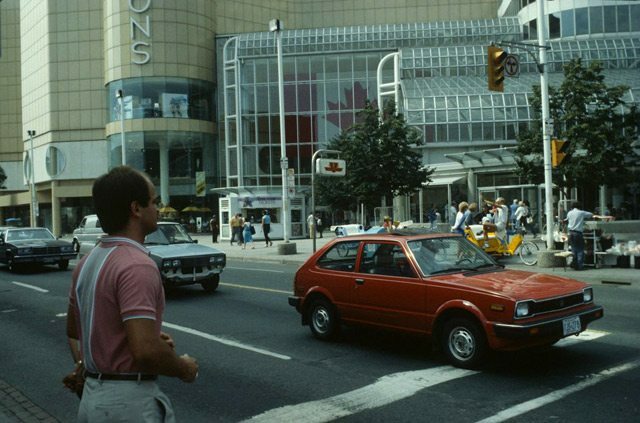 As Nordstrom announces its move into the Eaton Centre, a look at the history of the mall's northern anchor space. 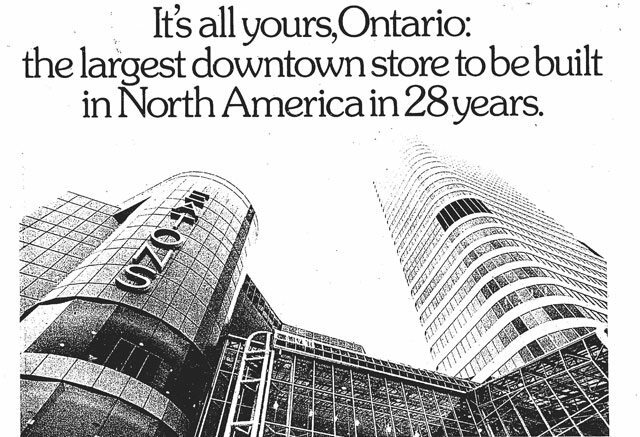 From an advertising supplement promoting the opening of the Eaton Centre, the Toronto Star, February 8, 1977. After months of rumours following Sears Canada’s decision to close its Eaton Centre store, Nordstrom announced this morning that it will open at the corner of Yonge and Dundas. Scheduled to open in the fall of 2016, the high-end American retailer plans a three-floor department store; it’ll take up one-third of the space shoppers enjoyed when Eaton’s opened on the site in 1977. 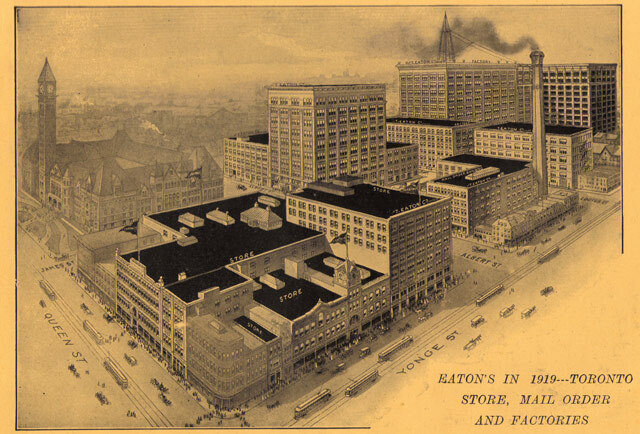 Eaton’s in 1919. A Souvenir of Eaton’s Golden Jubilee 1869–1919 (Toronto: T. Eaton Co. Ltd., 1919). Eatons had been on Queen Street, across from Simpsons (now the Bay) from the end of the Victorian era. Besides the main store, it spread out into a series of buildings—some used as retail space, some as office, some as manufacturing—along James Street, something like a polished version of how Honest Ed’s is stitched together. By the 1950s the old store was getting creaky and management wanted a new facility, or at least the chance to fix up what they had on Queen Street, and build a retail/office development around it. Back at the drawing board, plans picked up steam again following discussions with developer Fairview Corporation (later Cadillac Fairview, which still owns the mall). Fairview placed three conditions on its involvement: Old City Hall had to be preserved; Eaton’s would be the main tenant in the office tower at the north end of the project; and Eaton’s had to move its store from Queen Street to Yonge and Dundas. Since Simpson’s was at the south end, this would provide an anchor store at each end of the mall, in a set-up similar to suburban shopping centres. The Eaton family balked at moving the store; it took a year of negotiation before they agreed. City of Toronto Archives, Fonds 200, Series 1465, File 420, Item 16. Designed by chief architect E.L. Hankinson, plans for the 1 million square foot store included nine floors of retail space, stretching from teen fashions on 3 Below (now the Urban Eatery food court) to home entertainment and kitchen appliances on the sixth. Food offerings included snack stalls; Sir John’s restaurant, which served liquor (a development which would have horrified the store’s teetotaler founder, Timothy Eaton); and, on the sixth floor, the 1,000-seat Marine Room. The new store also offered an 8,500 square foot event space, though it lacked the grandeur of the College Street store’s Eaton Auditorium and Round Room. In August 1999, after years of declining sales and bad marketing decisions, Eaton’s filed for bankruptcy. 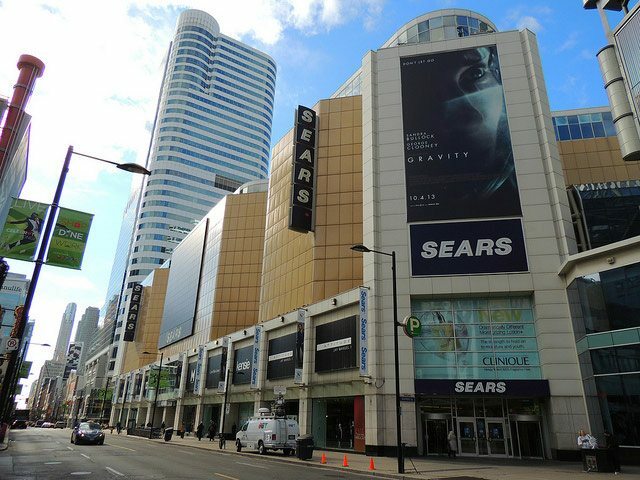 Sears Canada picked up the remnants of Eaton’s two months later and decided to relaunch seven locations, including the Eaton Centre, as an upscale chain. Rechristened eatons (sans capital letter and apostrophe), the new store launched a month behind schedule in November 2000. Despite expensive remodelling and a flashy, aubergine-themed ad campaign, the new chain barely had time to overcome its initial mistakes before Sears threw in the towel in February 2002. That summer saw the store finish its conversion into a Sears store. There were lingering attempts to carry a more diverse range of products than your average suburban outpost. Floor reduction, which had started in the 1990s, continued. Upper floors were replaced with office space. As Sears Canada’s fortunes declined, rumours ramped up over just how long the Eaton Centre branch would last, a question which was answered last October. When the eatons brand was retired in 2002, Sears Canada CEO Mark Cohen noted that “The notion that customers see value in a top-drawer, high-priced, somewhat selective assortment is false. [Canadians] value very high levels of presentation and customer service but don’t exhibit any desire to pay for it.” Yet high-end retail has increased in recent years as the gap between upscale and downmarket merchants widens. It remains to be seen if Toronto will support three Nordstrom locations (Eaton Centre, Sherway Gardens, and Yorkdale), or if we’ll be writing about other branding change at Yonge and Dundas a decade from now. Additional material from The Eatons: The Rise and Fall of Canada’s Royal Family by Rod McQueen (Toronto: Stoddart, 1999), the February 11, 1977 edition of the Globe and Mail, and the February 7, 1977, February 8, 1977, February 10, 1977, and February 19, 2002 editions of the Toronto Star.